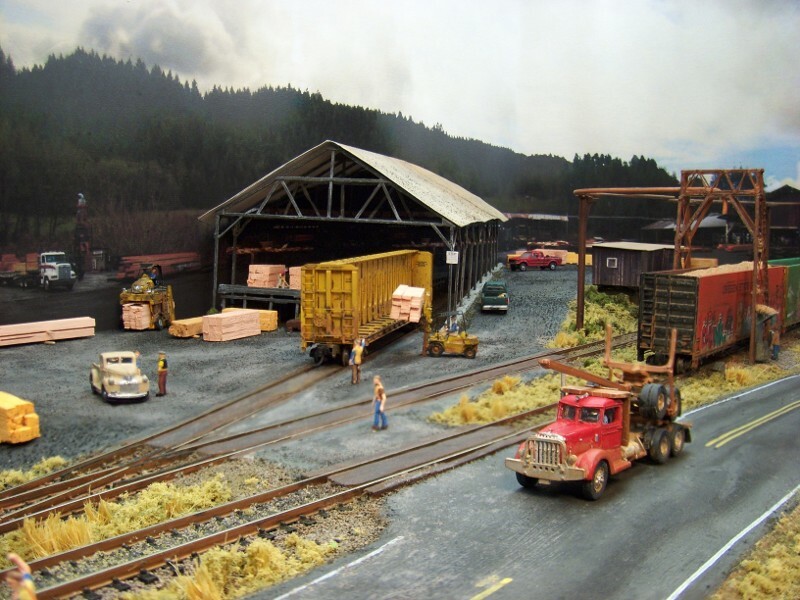 Another delightful minimum space layout…..
Dawson Station is my portable 1′ x 4′ n-scale model railroad layout and is based on the Hull-Oakes lumber mill located in Dawson, Oregon. Hull-Oakes, one of the last steam-powered sawmills in North America, is located on the end of a six mile spur in the foothills of the Coastal Mountain Range. Until 2007, when a rail embargo began, the mill shipped large dimensional lumber and woodchips by rail. Being at the end of the spur, and with limited sidings, it presents an interesting switching puzzle. The layout has compressed this into a 3-2-2 Inglenook puzzle, and requires that the empty cars be switched in to the correct locations, and the full cars switched out. To further complicate the problem, a caboose is required. The layout has it’s own website, with plenty about the model, and also the interesting prototype location. Worth a read to pick up some ideas…. This entry was posted in Hints and tips, Inspiration, Layout design and tagged inspiration, layout design, model railway, small layout design. Bookmark the permalink.